The trip began with a visit to Sultan Mosque at Arab Street, a neighborhood, according to several sources, believed to be named after a noble Arab merchant and was residential village or ‘kampong’ for Muslims of Arab, Malay, Indian, Bugis, Javanese, and Boyanese descents. Arab Street was, then, a bustling trading center with businesses ranging from textiles to spices, and to rattan products*. As it was the season of Ramadan, the ninth month of the Islamic calendar and a month of fasting when we made our mini ‘field trip’, Arab Street was flushed full of festive activities. The weather was unbearably hot in the early afternoon, and it soon became too hot to stay outdoors. I suggested the group to take a break at a Halal Swedish café for some refreshments and deserts (the term ‘halal’ is used to designate any object, including food, or an action which is permissible to use or engage in, according to Islamic Law*). After spending time at Arab Street, it was time to visit Little India, another neighborhood not-so-distant from where we were that has Tamil cultural elements*. Little India was buzzing with energy, as the smells of spices and food assaulted the senses of the group. I was with two of my peers, Ramya and Susie Kao, and we found our way into Mustafa, a 24-hour shopping mall catering mainly to the budget market and a retail hub that has numerous Indian and tourist shoppers*, to get yet another drink and some airconditioning to cool down. Even though I am a Singaporean, this was actually my first time at Mustafa. It was amazing to experience the buzz that Mustafa is famous for and I was incredibly impressed by the sheer variety of products in the place from electronics, jewelry to household appliances and grocery items. Ramya then remembered to get some microwavable Pratha, an Indian bread, as Susie Kao got herself a bottle of designer Australian root beer. After Little India was the highlight of the day – we were due for a National Day celebration five-course dinner at the roof top restaurant at Esplanade, a famous performing arts venue* with the shape of a famous tropical ‘smelly fruit that tastes like heaven’ – durian. We were joined by fellow Singaporean Waseda student Evangeline Neo, a comic artist. The restaurant has an awesome view of the National Day events – an open-air deck that overlooks the National Day Parade from afar. The food was quite fabulous and the view was breath-taking. Sights of Apache and Chinook helicopters were really delightful. One of the helicopters flew very close to the waters and the leaves from the trees were dancing to a national heartbeat. When the fireworks burst into the skies, I was simply overwhelmed. I am a big fan of fireworks, and our National Day fireworks have to be one of the best things on earth for me. During the dinner, drinks and food flowed, and good conversations followed. Everybody was just having a great time. 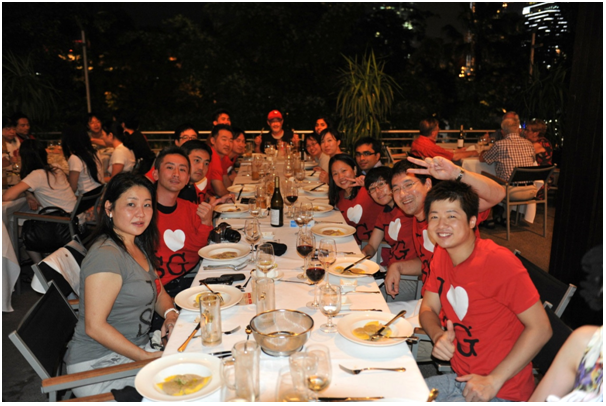 Waseda staff presented all of us a souvenir tee shirt: An “I (heart) SG shirt” and that really enhanced the festive mood of the night. 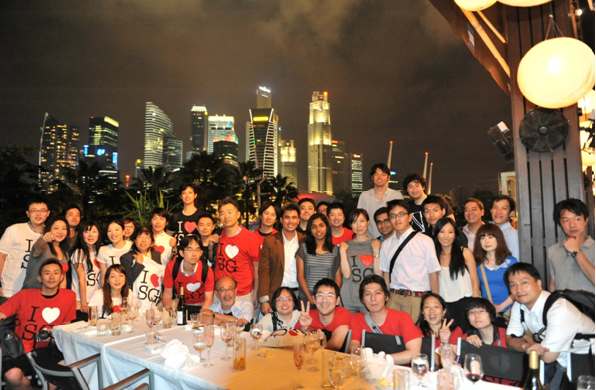 I was proud to be Singaporean on that day, with my foreign guests enjoying this wonderful festive experience.